2017 for my family was as Queen Elizabeth the second described her 1992 “annus horribilis” to say a lot of stuff happened would be a bit like saying “Trump has opinions” True, but it doesn’t go anywhere near far enough. I and my husband tried hard to keep positive however by June 2017 we were beginning to fear leaving the house; if an aeroplane was going to fall out of the sky and land on someone it was going to land on the Holgate family. Deaths, severe health scares, hard drives, electrical goods blowing up (so much so we checked for electrical faults in our wiring! ), accidents, random plumbing problems (that plumbers had never seen in “25 years of business”) and even both cars were hit when we were not in the cars in to different towns within 2 weeks. (And that folks is just a few of the things that happened last year.) So when you combine a lot of stuff happening to you that feels totally out of your control and you have 2 businesses to run, 3 books to promote, 2 teenagers, 1 dog and 3 autoimmune illnesses including Lupus, I think I can speak on the subject on how to get through tough times. Don’t blame god, the planets, anything or anyone else. I can remember that we would just start to find a way to think positive and then something else would happen and I got to this bizarre stage where I would whisper to my husband or look to the sky and say “don’t tell anyone….” As if what was happening to us was pre-planned or our fault. With so many negative things happening we questioned if we were carrying out the right maintenance, servicing etc, and we were able to see clearly that everything was well maintained it was just luck of the bad variety. No big plan. No one trying to destroy our happiness or our futures. Just luck. We all get it – good and bad, and alas that year we learnt it is not delivered in equal quantities. However, blaming anyone else doesn’t help you and that is the important thing to remember. 2017 cost us a small fortune and we renamed 2017 “The year we spend money on stuff we already own.” That in itself was frustrating, however, we learnt to rethink our way out of the negative thoughts and create positive actions. We couldn’t change bad stuff happening, however, we could choose how we thought about it. As a coach and author on this subject, I really appreciate the power our thoughts have on our actions and thus our results. I wasn’t going to let any of us stay in a negative mood for long. One practical thing we would do is after dinner I would get the family playing silly games like “Would you rather eat your own leg, or dog poo” or “If you could only eat one thing for the rest of your life what would it be?” silly games but they got us out of our own heads, made us laugh and forget the things that were troubling us. Moving on from this we would reframe what was happening for instance “At least no one was hurt when the cars got damage” Or “This is a great chance to check our health in every aspect and be in the best health possible.” Not easy to do, however the four of us learnt to support each other to create thoughts that took negative into positive. I worry that too much talk online aims to get us into a positive mood. 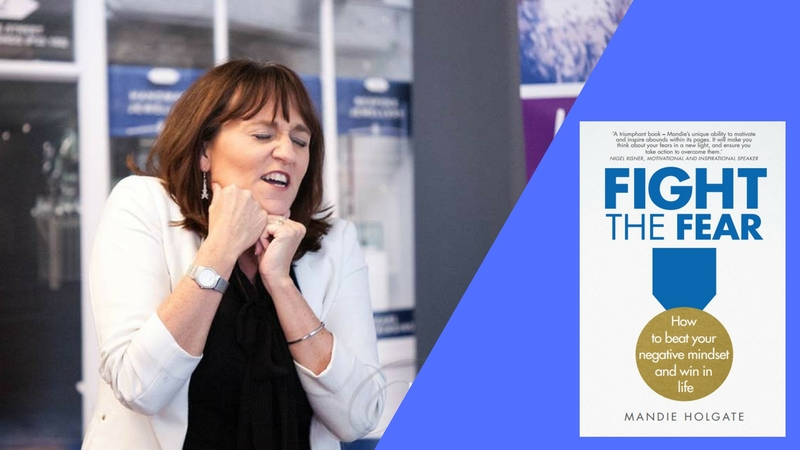 Okay, my book is called Fight the fear – how to beat your negative mindset and win in life, however, I do honour and respect the need to accept and hear our negativity before we return to positivity. If things feel really tough and you feel like giving up; get angry, cry, scream, throw pebbles into the sea, rip up a tissue, swear (out of earshot of others) but let your whole self-process how you are feeling. For me, because stress causes my pain and exhaustion to be worse I had a silly thing that I would do and that was go to the other side of the house and shout swear words with the word “Womble” after each swear word. Completely childish and in no way directly fixes anything, however, because the Wombles was a childhood TV show I loved the actually act would make me breathe deeper, laugh and deal with my frustration. It always ended in laughter, sometimes there were a few tears, and they were fine too. It is important to remember to move on from negative emotions we have to see the emotions that are getting to us. Don’t feel ashamed of your emotions and feelings, it’s perfectly normal to feel like this, as long as you find a way to get out of it again. No matter how dreadful things are there is always some good in our lives. I understand that it is easier said than done, however finding the good really can help. Before I go to sleep every night I create a list of 10 things I’m grateful for. From a new client phoning that day to the hug from my daughter. With our world being the way it is, you should be able to come up with 10 things that make you feel so damn happy to be you. (At my worst when I could not leave the house, get downstairs, open the curtains or even read a book, this was not easy however I would come up with things like “At least it’s not cancer” “Thank you for my home” “Thank you for my bed to rest in.” Not as exciting as “Thank you for letting us win the lottery” or “thank you for the mansion” however when you really appreciate what matters in life most people are not concentrating on sportscars or marble worktops, they are focusing on love, respect, trust, kindness, etc, etc. What emotions are you going to look to find every day in your top 10? It can be fearful to even consider coming up with a plan, because you feel like everything is out of your control. However, having a plan doesn’t have to mean that you map out your life and plan every detail like you’re planning a royal wedding. Plan big and plan small. Plan that this week you will ensure there is one hour where you do something you love. Plan one phone call that you know will make you feel good or loved. Look at your big ambitions for life and plan one thing that gets you towards that. And if you feel like you can’t achieve anything that is a perfect time to get into this habit. This again does not need to be big. It could be that your ambition is to write a book, so plan to write for 10 minutes twice a week. How can you build on this? If your big ambition is to own a house by the sea then look at where that might be. With plans you need to consider the science of being you, i.e. “What is my natural style?” are you someone that gets on with things purely because you know you must or are you someone that needs a cheerleader, a list and someone to kick you into action? (By the way, I’m happy to be part of your motivational pit crew, tag me on Facebook anytime to keep you motivated!) Also, ensure your plan includes a few things that make you just a little bit uncomfortable. Maybe you hate tidying up or can’t stand large groups of people. Push yourself to consider what you want in life and notice the things that you steer clear of. How can you factor this (delicately) into your plan? By doing this you push your comfort zones just a little and that can work wonders for making us feel good, that feeling of “Wow I can’t believe I did that!” can really spur you on! I know I said have a plan, however in life it’s like being in a maze and while that can be amazing when it works out and you get to the prize, it can also feel so frustrating when you are convinced getting around this corner will get you what you want and then you are hit with another impassable wall. Know when to fight that wall and keep going and know when to adapt and be agile. Sometimes the best course of action is no action. Know the difference. Know when to step away and have a break from everything on the planet and know when to push on through. I’ve found in my own life that despite being a driven person with big ambitions that when I go with the flow and listen to what my body and mind need I get there quicker. Fighting it with the “I must carry on” attitude has rarely delivered to me or my clients. We have to know why we are fighting and when to step away, which leads me to the last top tip…. And lastly, remember this – everything changes. This is important for the good times and the bad because nothing stays the same. A tree never looks the same year after year, your face or body changes, your job changes, your family change, your friends change, your bank balance changes, everything changes. It may not change overnight, however, nothing stays the same. This is an important thing to remember for 2 reasons; when things are good – how are you planning for tougher times? And when things are good – what do I want to see in the good times that are heading my way? I’m happy to write about the things that matter most to you, so feel free to get in touch and share what you would like some advice on. I can keep your request confidential. Connect with my via my website or via Facebook. Here’s to your success and a great day. How is Growing Up Working For You?